Incessant scratching, shedding and inflammation are just a few of the signs that your dog is suffering from skin problems. There's a good chance that your dog's infection is the result of another underlying condition, such as parasites or allergies. Clinical diagnosis is necessary to determine the type of infection present as well as any other health issues that might make your dog vulnerable to bacteria. Bacterial folliculitis, caused by Staphylococcus pseudintermedius, is the most common bacterial skin infection in canines, according to the Animal Hospital of Montgomery in Montgomery, Alabama. This disease is characterized by inflamed hair follicles, which can lead to visible pustules beneath the skin, as well as redness and swelling. Golden retrievers are prone to follicular lesions around their toes. Dogs can carry strains of Methicillin-resistant Staphylococcus aureus, although infections are rare in animals compared to humans. Laboratory tests will reveal the presence of resistant bacteria, so your vet can determine if there's a risk to you or your family. 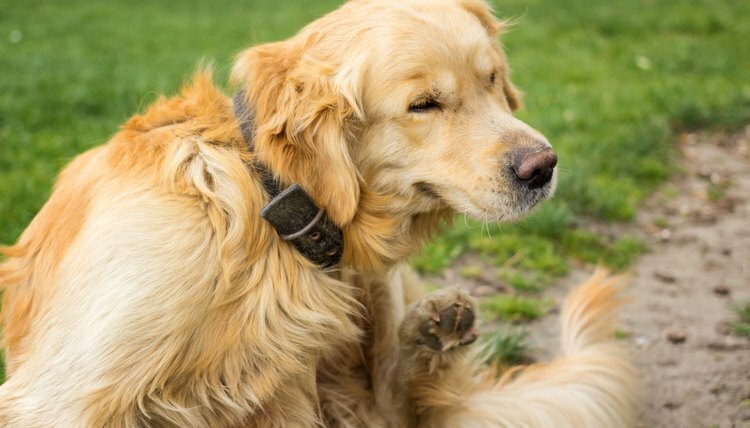 Constant scratching or licking is your first clue that your dog is suffering from skin discomfort. Excessive itching only makes matters worse, because the damage opens the way for further infection and delays healing. Look for patches of red bumps, bald patches and other abnormalities. Pustules often arise from bacterial invasion, as hair follicles and small wounds develop active infections. Too much licking can harden the skin into hairless knots called granulomas or lick sores. They are firm to the touch and are usually found on the limbs or paws, according to Stone Ridge Veterinary Hospital in Rochester, New York. Your vet may test your pet for allergies, parasites and other pathogens to find the underlying cause of the infection. He can examine a scraping to identify ringworm, mites or other common health issues that may be present. Blood and urine tests can reveal internal problems, such as hormonal imbalance or immune deficiency disorders. Dogs also can suffer skin problems due to allergens in their food or environment. Your vet may recommend sensitivity trials if he suspects allergies are the cause. He likely will take a culture of the bacteria to determine if it is a resistant strain of staph. Treating bacterial infections often requires a course of antibiotics as well as treatment for the underlying cause, if there is one. Most surface infections can be managed with regular application of antibacterial shampoo or spray. Deeper or more widespread infections often require medication in the form of pills or injection. Skin infections can be persistent and continue to emerge periodically for months. In these cases, treatment may be re-evaluated or extended by your veterinarian as you deal with the other issues present. Removing the underlying cause is the key to managing recurring infections.